soon as he had moved the capital to Seoul. The god of the earth was placed in the east, and the god of harvest was placed in the west of the main palace. 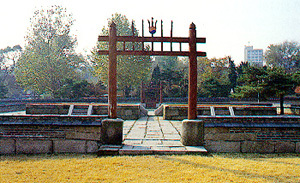 Kings came here to perform religious services every year throughout the Choson Dynasty. Rituals are still held twice a year in spring and fall.